1940s men’s fashion for day, sport or evening was styled to make a man feel “larger than life.” During 1941-1945, WWII fabric rations limited cloth to make suits but not style. Middle class men chose basic business suits that haven’t changed dramatically since the beginning of the century. The notorious Zoot Suit with its bright colors, baggy legs and long jackets was a complete deviation from the norm– an underground rebellion worn by inner city youth. What makes 1940s men’s fashion unique to the decade is the cut of the clothes, the patterns and the stylistic details that demonstrated one’s patriotic support of his country (or lack there of). Walk through 1940s fashion history with me as we study what typical civilian men wore. In the 1930s, men’s fashion was big. Big suits, big pants, big prints, big colors. During WWII, the USA war board placed restrictions on men’s clothing just as they did for women. 1940s suit pockets could not have flaps, trousers could not be more the 19 inches around or be cuffed, and suits were sold without vests (waistcoats). The cuffed look was so popular that men quickly figured out you could purchase longer length pants and cuff them at home. In Britain, the clothing restrictions were harsher. Jackets could not have pleated backs, metal zippers or buttons, feature raglan sleeves or have half belts. Most men kept their clothing from the 1930s and wore them through the early ’40s. It was a sign of support for the war to be seen in your pre-war suits. War time clothing continued to influence men’s fashion design after the war by coping or modifying uniforms into civilian clothes. Trench coats, bomber jackets, knit undershirts, pea coats, chino pants, and aviator glasses all have roots in With so much military surplus available after the war, civilians would buy and wear military clothing for several more years. The improvement in machinery, textiles, and manufacturing of military clothing made post-war ready-to-wear civilian clothing a booming industry. The biggest influence war time restrictions had on men was a further introduction of casualness. Men were tired of scratchy uniforms and confining suits. The freedom that casual clothes brought to men was a big sigh of relief. Hawaiian shirts, for example, were worn all day, and even nights, in the summer. Strict codes of dress were impossible to enforce when the majority of people couldn’t afford a large wardrobe, even after the war ended. Ironically, the very clothing that caused such turmoil during the war years, the Zoot Suit, was the single piece of fashion that influenced men’s post-war clothing. Longer, looser, jackets, double pleated pants, big hats, and even wider ties made their way into late ‘40s men’s fashions. Men were eager to put the war behind them and embrace the clothing they were previously forbidden to wear. During the ‘40s, suits were still everyday wear for men, whether they were going to an office job, to a picnic or out to dinner. Men’s 1940s suits were usually made from thick wool, worsted wool or tweed, but during the war synthetic rayon blended with wool was usually used instead. Colors were muted – black, navy, grey, dark brown, tan, and medium blue. During the summer, lighter fabric colors were medium grey, brown, medium blue, and tan in the warmer months. Tweed, herringbone, check, and overplaids were also very popular suiting patterns. Wide chalk stripes were also a classic ‘40s suit pattern. The single-breasted jacket was had 2-3 buttons, wide padded shoulders, patch or slit pockets, and tapered into the waist slightly. The lapels were wide notch or peak with rounded edges. The width made a man look bigger even though the cut was narrower than in the ’30s. The double-breasted jacket was even more popular in the 1940s for the extra width it caused, although sales were restricted during the war years. Learn more about 1940s men’s suits or buy 1940s style suits here. Vests (waistcoats) were considered a wasteful item both in war time and after, and most men preferred not wearing a vest with their suits at all. It was cooler and more comfortable without them. Besides matching the suit, vests were V-neck cut with pockets on either side. Buy vintage style men’s vests here. The suit trousers were usually flat-fronted or with single pleats. They were worn at the high waist with a 3 inch waist band. Trouser legs were wide around the ankle which are the opposite of today’s “skinny” suits. Usually, they were either straight hemmed at the bottom as required during the war or having 2 inch trouser cuff (turnups) which most men preferred. Wide leg pants are difficult to find in stores today. Here are some options to buy online. Suspenders were worn by men in the ‘40s, although belts were more popular. They came in thick stripes with button loops. Shop suspenders. Belts had largely replaced suspenders as pants became more fitted at the waist. They were about an inch or so wide with small metal buckles that were often covered in matching leather. The leather was tan, brown or black and could be plain or pebbled, braided or stamped with a Western motif. The collared dress shirt was worn with suits or by itself with a pair of slacks. Dress shirts were usually made from cotton with an attached, large, pointed collar called a spearpoint collar. Shirts were colorful. White was an option but men choose blue, tan, yellow, green or grey shirts in solid, thin stripes or pin dot patterns. Shirt lengths were short by today’s standards and worn tucked in with an optional single pocket on the chest. Buy 1940s style dress shirts. No suit would be complete without the perfect tie! Neckties were made exclusively from silk, rayon and wool. They were panel ties (made from one piece of fabric) and fairly wide. They were also worn short to two inches above the pants’ waist. Geometrics, curly lines, monograms, and Art Deco style were done in bright colors. Animals, plants, flowers, birds, Western and tropical themes were everywhere. Ties were often themed around the wearer’s hobbies and interests like painting, fishing or hunting. The crazier the tie, the better! Bow ties were also still worn but less popular. Read more about men’s ties here or buy 1940s inspired ties. No 1940s suit would be complete without a pocket square, otherwise called a handkerchief. These were made from rayon or silk after the war and were often brightly colored or had paisley or other classic patterns. They were folded into a triangle and placed open side up exposing two or three tips. Don’t use these for practical purposes – keep that one in your pocket! Zoot suits had been popular at the start of the ‘30s. However, by the time the ‘40s rolled around, the suits were strongly associated with gangsters. Most men were fighting overseas, and the over-sized suits – which went against fabric rations – were seen to be unpatriotic. Zoot suits were often pinstriped yellow, green, bright blue and purple fabrics- the opposite of military drab. The suit itself was an extremely loose long and wide two button suit jacket with large notch lapels with huge shoulder pads worn over extremely baggy trousers that came about halfway up the ribs. The pants tapered at the bottom to a very tight cuff at the ankle and were held up with suspenders. A plaid button-down shirt, wide tie, shiny leather shoes, and a wide-brimmed fedora hat completed the look on the east coast. In the west, the tie and hat were replaced by hair greased back into a ducktail. Read more about Zoot Suit fashion here. It is interesting to note that despite the Zoot style being considered unpatriotic during the war, afterward the style became the new men’s look of the late ’40s and early ’50s. Large double-breasted baggy suits with high waists, pleated trousers, and wide brim hats returned to fashion just as they were in the 1930s but now with a taste of the Zoot in them as well. For those who didn’t wear suits to work, a collared shirt and work trousers in sturdy cotton twill or gabardine were the way to go. Work trousers had flat fronts with a single leg crease. The leg widths were also generally narrower than a suit or sports pants. Colors were fairly basic tan, brown, navy, and hunter green, although sometimes plaid was thrown into the mix. A matching trouser and shirt set was common for most lines of work. Work shirts had open soft pointed collars, two patch pockets, and pleating at the back and armholes for freedom in movement. A solid color tie worn with the work outfit kept men looking fine in public settings. More about 1940s men’s uniforms and work clothing. Sturdy cotton canvas coveralls were worn by men that had to get dirty on the job. They were all one piece that buttoned down through the fly with a straight leg. They belted at the waist, had long sleeves for protection and a pointed collar. They also had big patch pockets on the chest for keeping things handy. Learn more about and buy men’s vintage workwear. Postwar casualness opened the floodgates for men’s knit shirts, vests, and pullovers to dominate after work hours. They were made of textured ribbed knits that fit very snugly with a wide rib bottom and smaller ribbed sleeve and neck bands. Necks were almost always round and high on the neck with a small V-neck as an alternative style. They could be worn tucked in or untucked, with the former being the most common style. Solid colors, wide horizontal stripes and “Norwegian” designs for winter were especially common. A pullover vest creates an ideal 1940s casual style. Casual collared shirts could have long or short boxy sleeves and were straight cut at the bottom. Large soft collars could also be worn closed just like dress shirts but more often were worn open with the top button undone. Shirts came with two chest pockets that came in welt, button or fold over flaps. Colors could be plain tan, brown, blue, green or maroon, and plaids, checks, windowpane, and stripes were also very popular for casual wear. The Hawaiian ‘Aloha’ shirt, featuring hand painted tropical scenes, birds and flowers were introduced after the war. They were worn untucked and fit rather loose. They were imported from Hawaiian although most designers also made tropical themed sports shirt part of their mainland collection. Shop 1940s inspired men’s shirts. Hollywood’s wave of American western movies spawned an interest in western style clothing for boys and men. Western shirts, hats, boots, and trousers were popular equally with city and country folk. You could say that the Urban cowboy began in the 1940s. Trousers sold separately for casual day wear, sporting events and some work environments were a bit more colorful and comfortable then suit trousers. They were made of lighter weight wool blends in the cooler months and even lighter cotton poplins, gabardine (rayon blend) or seersuckers for tropical climates. Solid colors of green, blue and tan were staples, while more unique patterns like plaid, pinstripes, diagonal stripes, pin check, and herringbone in medium blues, maroons, and browns were favored. They featured a narrowed high waist and full hips with straight wide legs. Flat fronts were preferred over a single pleat, although both were acceptable. Waistbands had the dropped belt loops, which always had a thin leather belt worn with them. Shirts were worn tucked in, exposing the pants fully. Shirts rarely matched the pants. Instead, tan pants were matching with maroon shirts, plaid with brown, pinstripes with blue, etc. Sports coats, too, were a newer trend that gained popularity in the 1930s. They, too, came in a smattering of glenn plaids, herringbone, chevron checks, chalk stripes, and tweeds. They were worn with solid color pants that were darker than the sport coat, with the exception of white pants, which were worn with a navy blue sport coat. Sport coats had wide rounded notch lapels, two very large square pockets, and 3 button closures. Pockets came in a variety of flap, slit or patch styles. Learn more about 1940s men’s casual clothing here. Men’s sweaters were generally wide or cable ribbed with a wide ribbed hem and cuffs. They could be crewneck or a small V-neck. Cardigans were a very popular look, with a V-neck and buttons down the front. Some zipped up the front and featured a small, rounded stand-up collar. Cardigans often had two low front patch pockets, as well. For extra winter warmth, cardigans could have a large shawl collar that could be worn down or up and wrapped with a warm scarf. Shop vintage men’s sweaters. 1942 men’s sweaters worn over a button down shirt and tie is timeless. A wool overcoat was a winter staple for the ‘40s man. They were cut straight and very boxy, coming down to the knee at a very slight angle. The shoulders were rounded and sometimes came in Raglan cuts. They had very wide, peak lapels and side-angled slit pockets. The buttons down the front were covered over with a long flap. After the war when wool restrictions were lifted, a double-breasted version became popular. It was worn with a wide belt at the waist. These overcoats were usually tan, plaid, tweed, or herringbone with plaid cotton flannel or rayon cotton blend linings. For spring and fall, a lighter jacket would do. Made from wool or cotton poplin, they had buttons down the front, pointed collars and small lapels. Patch pockets held the essentials. Some jackets were a pullover style without buttons at all, with cotton ribbed cuffs and hems instead. These had crew or V-necks. Colors were kept neutral – tan, brown or navy. For a spiffier look, navy or hunter green panels were inset into the fronts of tan jackets. One of the most iconic and collectible ’40s jackets today is often called the Gabardine jacket named after the material. It was made of a rayon and cotton twill blend that had a soft shine to it. The smooth material made the design very plain with angled slit pockets on the sides, 5 buttons down the front or zipper in the later ’40s, and an optional chest pocket with a flap. The jacket hung straight down to the waist and was fitted only with a half belt at the back and two adjustable side belts. The jacket collar was soft wide points worn loose and open for the most casual comfort. Air force flight jackets were one of the most sought after military items for everyday wear. They were made from brown leather and sometimes had a cream fleece lining. One version came to the waist and had a pointed collar. Thick cotton ribbing at the cuffs and hem kept it snug. Another version was a little bit longer and belted at the waist with big front patch pockets or two. De-regulated flight jackets were quickly snatched up by civilians in the post war years. Shop men’s vintage coats and jackets. During the ‘40s, every man had a hat on his head! The fedora, also called a trilby, was by far the most widely worn style. It had a 2.5-3 inch brim and a tall pinched front crown with a center crease that was either flat-topped or angled to the back. Done in wool felt, they were grey, black, dark brown, tan, or cream. The brim was usually bound in petersham ribbon, circled around the crown and ended with a flat bow on the side, sometimes with feathers. The other popular felt hat of the 1940s was the homburg. It came only in grey or blue, with black slowly fading out of fashion by the mid forties. The crown was quite tall with a moderate center crease. The brim was curled all around but especially on the sides, creating an oblong shaped fit. The curled edges were less tight than they were in the previous few decades, creating a wider, looser fitting hat. Black petersham ribbon bound the rim and hat band. The trend was to wear the Homburg slightly pulled forward and down on the forehead. This was the last decade for the Homburg’s popularity other than a short surge of trendiness in the ’80s when The Godfather movies were released. The most unique hat of the 1940s was the porkpie hat. Similar to a Victorian Gambler hat, it came in black or brown fur felt and featured a short oval flat top with deep crease around the oval. A wide curled brim all around with matching petersham rim makes the porkpie stand apart from the gambler. Worn at an angle with a thin leather hat band or wide petersham ribbon with flat bow in the same color as the hat kept it in style with the other felt hats of the 1940s. In tropical climates, wool hats were too hot. Instead, woven straw hats in the shapes of fedoras, porkpies and boaters were worn as they had been for the prior two decades. Read more about 1940s men’s hat history and buy new 1940s style hats. Shoes for men in the 1940s came in just a few styles. The most common everyday shoe was the lace up Oxford. Most Oxfords were a dark leather brown with a thick sole and sturdy heel. Details could include some brogue (small perforations) on the toe or in a fancy wingtip pattern. Solid black was another option for formal suits and dark clothing, as was white for light summer suits. Most men chose to wear a more sporty Oxford– the two tone brown and white shoe. These were worn with business suits and casual clothing alike. The patterns of white and brown were diverse. They are THE iconic style of the 1940s. Other casual options were moccasin style loafers, sandals for summer and sneakers for sports. Tall or short lace up sneakers looked like Converse shoes today but with a thicker sole. Learn more about 1940s men’s shoes here. Socks were worn fairly tall, to about mid-calf. Work socks came in shorter, above the ankle, lengths. They were made of ribbed wool or cotton or rayon blend with tighter ribbing at the top inch or two to hold them up. They were dark colors like brown, tan and blue, or light white and grey. Just like ties, socks also came in a wild range of colorful stripes, Art Deco patterns and argyle designs. Because elastic wasn’t used in socks yet, they tended to sag. Sock garters helped hold them up. They were an elastic or leather strap with two clips that grabbed the sock and another clip that wrapped around the calf tightly and held the socks in place. Learn more about the history of men’s socks here. 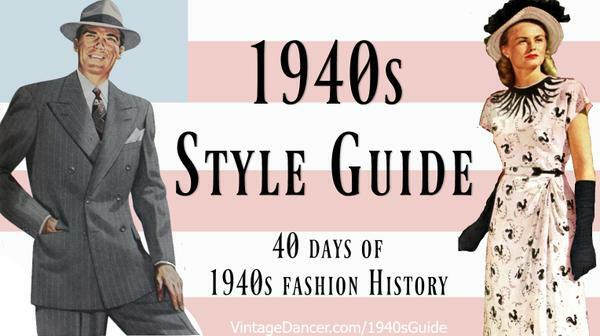 Swing Dance Clothing for Men- A Guide to Choosing 1940s swing dancing clothes that will keep you cool and comfortable. Sign up to receive the free 1940s Style Guide series via email. 40 articles about 1940s fashion history will be emailed to you over the next two months. 1940s men’s fashion, clothing, costume ideas. Can you mail a catalog? We are an online link source only. No catalogs. Hi Debbie, I have an odd question for you; I am no where near old enough to have seen with my own eyes the fashions of the 40’s, I cam along about 30 years too late for that, but it seems to me that men’s suits of that era were, and are still much sharper looking than the suit styles of today. Do you know of anywhere I can buy plans for 1940’s design men’s suits if I wanted to have a couple custom made? Thanks for all the information you have posted here; you’ve just confirmed my thoughts on men’s fashions of today. Love your article. I am always looking for reference material for men’s items in my shop. This is great. I am going to share and bookmark this. Glad I can help. I will be expanding on each topic as quick as I can gather all the research. Let me know if there is anything you need sooner than later.